ACS conducted a Phase I archaeological reconnaissance survey on a large property in Old Saybrook, Connecticut where five prehistoric sites and two historic site areas were identified. Most of the property, however, lacked traces of cultural resources despite a generous sample fraction of subsurface shovel tests due to the rugged nature of the property which contains two series of prominent hill ridges and a network of intermittent streams. A stratified-systematic sampling strategy substantially reduced the cost required to evaluate the property. 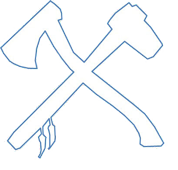 Prehistoric sites identified during the survey were limited to task-specific occupations represented by scattered traces of chert and quartz debitage. Not unpredictably, most of the sites were located in the small sections of the property containing glacial meltwater features which provide nearly level to gently sloping, well drained, non-rocky soils in close proximity to water sources. All five sites suggest short-term, task-specific or sub-seasonal occupations targeting resources such as quartz for the manufacture of stone tools and food resources associated with the extensive network of wetlands on the property. 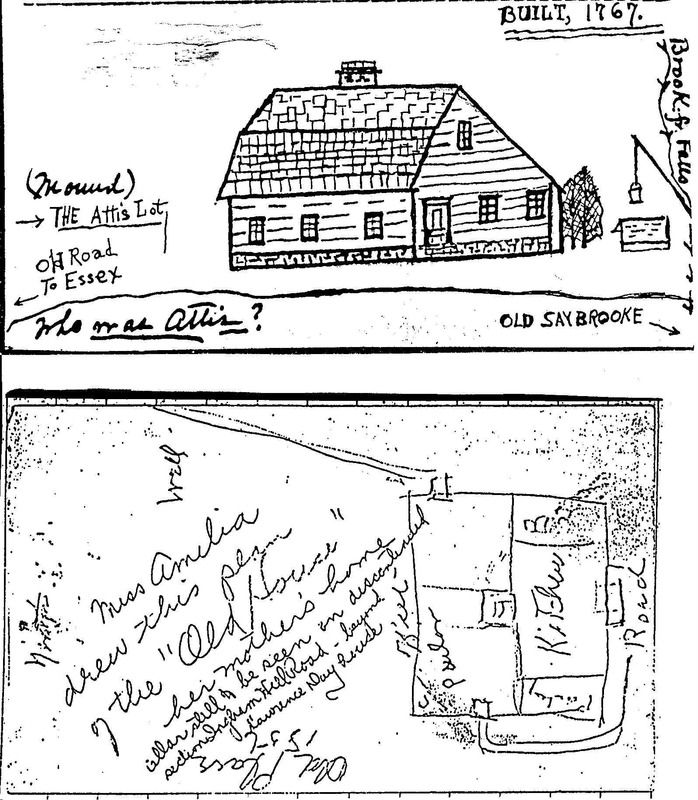 Two sketches of the Ebeneezer Ingham III house built in the 1760s. The sketches are included in a genealogical manuscript of the Ingham family. While ACS performs many surveys on properties slated to be developed into golf courses, ACS had the rare opportunity to conduct a survey on a former section of one of the oldest golf courses in North America. The Tuxedo Park historic golf course presents an example of a project where landscape features play an equal or even larger role than structural remains or artifacts in the interpretation of the past. Significant amounts of disturbance to the property, however, resulted in a dramatically reduced subsurface testing pattern. Located in the Ramapo Valley of Orange County, New York, the Tuxedo Park historic golf course was a late 19th Century facility catering to the wealthy patrons from New York City who vacationed at glamorous summer homes in the exclusive community of Tuxedo Park. The growth of industrialization during this era expanded the class of "nouveau riche" that also marked the increase of leisure time and representative facilities in American life. The Tuxedo Park golf course is commonly referenced as one of the oldest golf courses in North America, and was in operation until the mid-1950s when a highway was planned to run through the course. The project property was subsequently used as a gravel quarry, a landform-specific economic activity which unfortunately parallels the distribution of prehistoric sites in the region to a large extent. 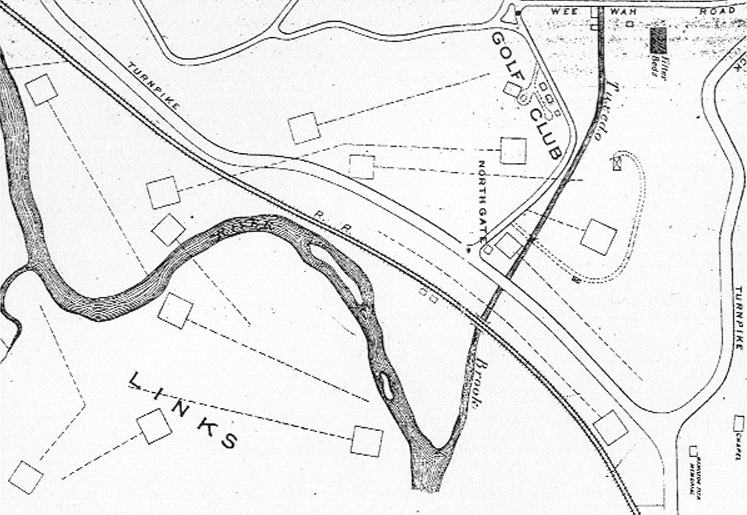 Phase I testing of the property was mostly limited to areas on the outskirts of the quarry and along the historic road that borders the project area. Traces of several prehistoric sites were identified on the property, but mostly in areas which had been disturbed by other historic processes such as orchard plantings, gardening, and grading. Several Madison projectile points in the assemblage indicate a Late Woodland (ca. 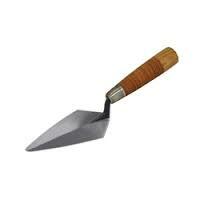 1,000 to 400 years ago) focus that likely included agricultural efforts. The well drained property would similarly be used for agricultural efforts into the historic era, as well as light industry marked by a saw factory that was in operation during the early to mid-19th Century. By the end of the century, however, the Tuxedo Park Association acquired large tracts of land, with some sections used to create an 18-hole golf course. Remnant features of the course on the property include several tee and green areas where considerable landscaping efforts are revealed by man- made terraces and knolls. Surviving structures include a caddy shack, traces of the clubhouse, and the stone foundation of a stable used to tend the horses and carriages of patrons. While the extensive amount of quarrying on the property substantially reduced the amount of testing required on this otherwise highly sensitive property, it unfortunately also impacted the integrity of the course and many of its prominent landscape and structural features. The distribution of historic sites on the property was predictably set according to different criteria. Historic sites were located predominantly along historic roads according to 19th Century maps, including a discontinued portion of an 18th to early 19th Century road that courses through the property. The Ebeneezer Ingham III homestead and associated barn site are located along this discontinued path. The barn area is visible at the surface by a faint outline of fieldstone boulders and a partial cobble ramp. Materials from tests placed in this area were limited to hand-wrought and cut nails, while an abundance of material from the cellar-hole area across the path includes a Scottish kaolin clay pipe stem, household ceramics, glassware, and nails. These sites were well documented by a genealogist whom ACS traced to Chicago, Illinois. Information provided to ACS included a detailed history of the Ingham family who timbered and farmed the site during the 18th and 19th Centuries, as well as the original sketch plans of the house and grounds. Extensive research into land records revealed that the property had been actively occupied by the Ingham family for over 100 years, and that most of it remained as open space for the entire 20th Century. In conjunction with the wealth of data provided by land records, historic maps, and genealogical information, this project serves as a good example of the important role that extensive background research plays in constructing interpretations of historic sites and use by their occupants. It also demonstrates change in land-use through time, with Native American groups relying on the property for the short-term procurement of resources, contrasted with a historic timbering industry which provided an impetus for the early Euroamerican expansion of settlement away from prime agricultural lands along the coast into the surrounding uplands. ACS stratified the project property into areas scoring between 0 and 10 according to the sensitivity model. Those areas scoring above two have a moderate to high sensitivity, and thus received the highest density of testing during the Phase I survey. Blocks of standardized tests were also placed in other areas as a control measure. Phase I testing resulted in the discovery of five prehistoric sites, including two within the core of the highest scoring area, as well as three other sites. One of the latter sites consisted of a rockshelter recorded during the pedestrian survey, site types not readily discerned by the sensitivity model as they tend to be small environmental features that do not appear on maps used to construct and apply the model. A small butchering site was also recorded across a minor body of wetlands from the rockshelter, containing processed bone and several chert finishing flakes. In conjunction, it is projected that the shelter served as a hunting blind, contemporaneous with the use of the associated butchering site. The third site was recorded near a rare spring-fed pond, another environmental feature not readily mapped or applied by the statistical model. The other two prehistoric sites were recorded on the glacial meltwater feature and were predictably more substantial in nature. These sites contained an abundance of lithic debitage and tool fragments indicating a seasonal camp setting. This survey illustrates the value of employing a statistical landscape sensitivity model in order to concentrate efforts on portions of project areas most likely to reveal traces of potentially significant sites. The survey also demonstrates, however, the need to consider micro-environmental factors and the value of pedestrian surface surveys to complement stratified-systematic sample fractions. ACS performed a series of surveys in "Trout Brook Valley" of western Connecticut. Background research and a surface survey were performed first to evaluate the cultural resource potential of the property. This large parcel is generally rugged, although a glacial meltwater formation occupies the central portion where prehistoric settlement was most likely to occur. Using a statistical prehistoric landscape sensitivity model, ACS was able to greatly reduce the number of tests required to adequately evaluate the property during the Phase I survey. 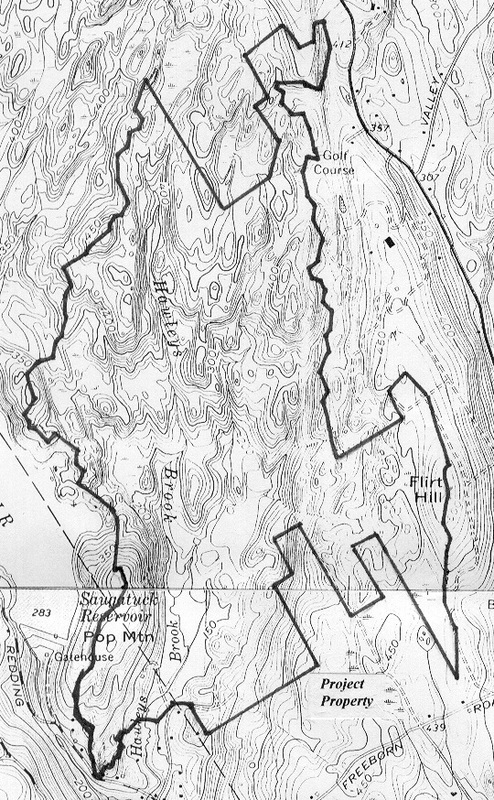 Topographic map of the Troutbrook Valley project area (left) with stratified zones based on the prehistoric landscape sensitivity model (right) created and employed by ACS. 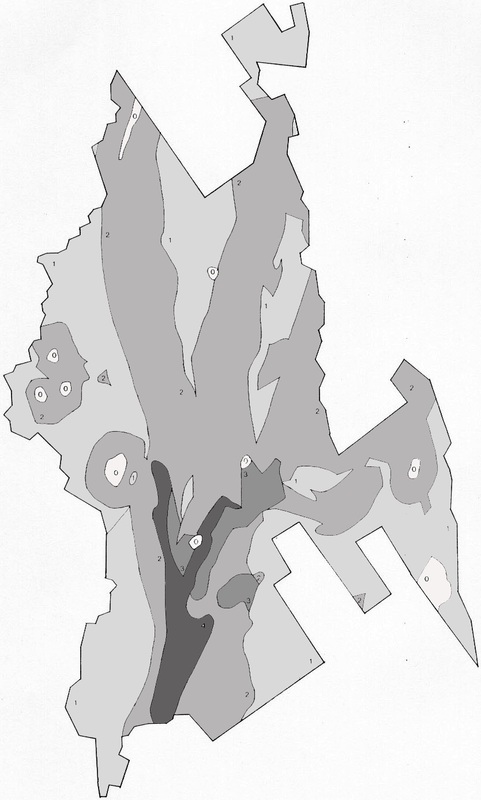 The partitioning or stratification of the landscape into areas of varying capacities to contain prehistoric sites has its theoretical foundations in hunting and gathering models which confidently demonstrate that land-use is predictably and statistically correlated with variability in the landscape. Thus certain landforms are found to consistently contain a disproportionate amount of prehistoric sites in any region. In the case of southern New England, this includes areas with nearly level surfaces supported by non-rocky sandy loams on glacial meltwater features in close proximity to major bodies of water. The statistical prehistoric landscape sensitivity model developed and utilized by ACS provides an objective method for partitioning project areas into differntiated zones of archaeological sensitivity. The model predicts prehistoric site location based on eight statistically significant environmental factors including landform, sruface slope, soil texture, soil drainage, nearest water source, drainage rank, and horizontal and vertical distances to water.